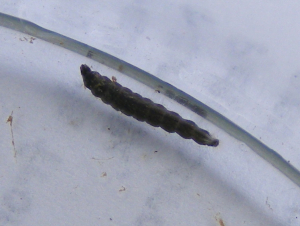 Observation - Aquatic Larva - UK and Ireland. Description: Black legless segmented aquatic larva with white bristle tail, caught in slow moving water. Black legless segmented aquatic larva with white bristle tail, caught in slow moving water.